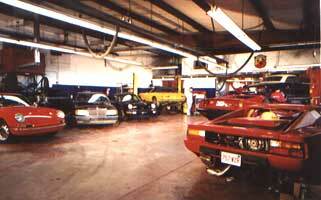 Motorsport Garage Ltd. has been specializing in German and Italian auto repair and restoration in the Boston area since 1975. We work on foreign imports only. Including Alfa-Romeo, Audi, BMW, Ferrari, Fiat-Abarth, Lamborghini, Lancia, Maserati, Mercedes and Porsche. The 9000 square foot facility is conveniently located in Allston, Massachusetts, only moments from the Massachusetts Turnpike (I-90), Memorial Drive & Storrow Drive, and the MBTA. Whether you need an oil change or a full restoration, Motorsports Garage Ltd. will provide you with the quality and precision that your car deserves. Contact us at (617) 783-3078 today for an appointment. Or feel free to stop by our garage during business hours and meet our friendly, knowledgeable staff. Hours of operation: Monday - Friday to 8am to 6pm & Saturday by appointment only.